Are You Using the Best Flat Iron For Your Hair Type? Heat hair straightening irons--also called flat irons--are two heated plates on an electric, handheld tool that are intended to press (flatten) textured hair follicles. Some curlies in the community have completely sworn off retexturizing via flat iron because of all of the potential for heat damage. With accessibility to more thoughtful, in-depth information on maintaining healthier hair and more options than ever before, textured people are returning to this old styling tool for temporarily straightened hair. Which flat iron should you use? Here are the most popular choices of flat irons and what makes them different from one another. Ceramic is popular due to it being the most economical option of these types of flat irons. It is great for smoothing and straightening hair at a lower temperature. Many of today's ceramic flat iron brands offer "ionic technology"--electronic ionizers that generate negative ions, which in turn will neutralize positive ions and seal hair cuticles, according to Conair. This results in shiny, frizz-free hair in which light is able to reflect off of easily. This option is "durable, long-lasting, and effective", according to Flat Iron Queen. 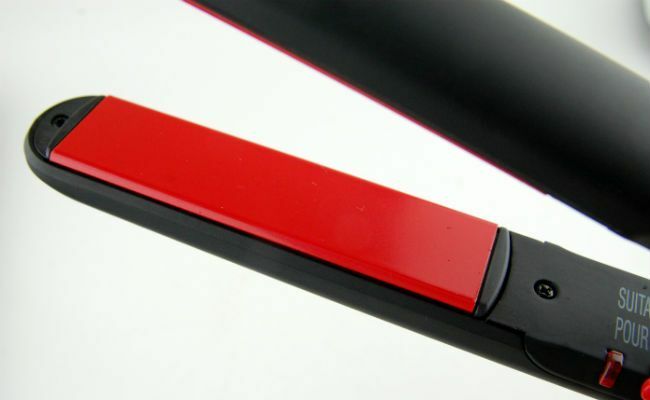 Ceramic flat irons are the best bet for those with fine, straight to wavy-curly hair. Watch Melissa Denise's natural hair blow-out and flat iron routine using Chi Air Class Tourmaline Ceramic 1"
A lot of times ceramic flat irons also have the word "tourmaline" in the title. These type of heat styling tools contain prismatic crystals that is added after being crushed into a fine powder, according to BeautySupply.About.com. The crystal boron silicate mineral helps smooth the hair cuticle and helps prevent further heat damage by emitting negative ions to counteract the positive ions which happens when hair is dry and damaged. Using a tourmaline straightening iron means most of the time you will only have to pass over each section of your hair once, resulting in less risk of heat damage. If you have fine but tightly coiled hair, tourmaline is a great option because the chance of it catching on your hair is slimmer than compared to using ceramic. Watch AlexandrasGirlyTalk straightening routine with KQC X-Heat. Flat irons that have titanium plates are usually sought after for this reason: titanium is the only metal that results in such a high level of both 'flatness' and sheen for curly hair. Titanium straightening irons come with a wide variation of settings, so the level of control is always in your favor when it comes to minimizing heat damage possibilities. And if you straighten daily and your hair is "heat trained", this type of iron is for you--its ability to withstand ultra high heat and resist corrosion makes it a long lasting hair care investment. If you have thick straight (relaxed) hair or coarser, 3C and type 4 hair, titanium flat irons are for you.